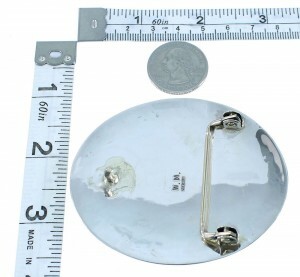 Belt buckle measures approximately 2-1/8" long, 2-7/8" at widest, and will fit a belt that is up to 1-1/4" wide. If you are looking for elegance and beauty, you have found it! 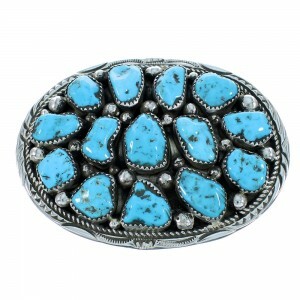 This piece of Native American jewelry is Navajo hand crafted by artist Marie Thompson, out of genuine Sterling silver and real Turquoise stones. A total of FOURTEEN stones are gently placed in hand cut bezel settings, while mini silver beads, twisted silver, and imprinted designs can be seen highlighting for a delightful finish. The belt buckle is stamped sterling and hallmarked.